(Nanowerk News) The Georgia Institute of Technology has been awarded a U.S. Air Force Center of Excellence to design nanostructures for energy harvesting and adaptive materials, and to develop tools to optimize critical cognitive processes of the modern warfighter. The $10.5 million Center, known as the Bio-nano-enabled Inorganic/Organic Nanostructures and Improved Cognition (BIONIC) center, is being led by Vladimir Tsukruk and Kenneth Sandhage, professors in Georgia Tech's School of Materials Science and Engineering. "Advanced materials is an area of importance for the Air Force since the landscape of materials science is rapidly changing and bio-nano-materials are classes of pervasive materials that exhibit unique capabilities and have the potential to address Air Force needs," explained Rajesh Naik, a scientist in the U.S. Air Force Research Laboratory (AFRL) Materials and Manufacturing Directorate. "In addition, improved cognition tools are required for assessing the cognitive ability of the warfighter as we ask for more from our human operators in the most demanding environments." 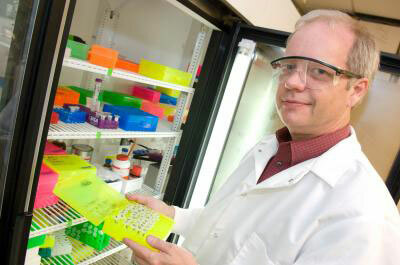 Kenneth Sandhage, co-director of the BIONIC Center of Excellence, is designing, fabricating, characterizing and modeling the performance of inorganic/organic nanocomposites for efficient, remote energy-harvesting devices, such as photovoltaics and batteries. The BIONIC center includes a group of core members from six departments within the Georgia Tech Colleges of Sciences and Engineering, a researcher at The Ohio State University, and scientists and engineers at AFRL. Lockheed Martin Aeronautics Company is also an industrial collaborator. Funding for the Center of Excellence is provided by the Materials and Manufacturing Directorate and Human Effectiveness Directorate of AFRL, the U.S. Air Force Office of Scientific Research and Georgia Tech. The initial award is for three years, with the possibility of an additional two-year extension. "Georgia Tech was chosen to lead this Center of Excellence because of its investment in infrastructure development, including new facilities and instrumentation; its recruitment of high-caliber faculty members and students; and its emphasis in bio-nanotechnology and cognitive sciences," said Morley Stone, chief scientist of the Human Performance Wing of AFRL's Human Effectiveness Directorate. There are three major research thrusts, called interdisciplinary research groups, within the BIONIC center. Each group contains several collaborators from AFRL's Materials and Manufacturing Directorate or Human Effectiveness Directorate. For the first thrust, which is led by Sandhage, researchers are designing, fabricating, characterizing and modeling the performance of inorganic/organic nanocomposites for efficient, remote energy-harvesting devices, such as photovoltaics and batteries. "The U.S. Air Force utilizes autonomous drones that they would like to operate for longer periods of time," explained co-director Sandhage, who holds the B. Mifflin Hood Professorship in the School of Materials Science and Engineering and an adjunct position in the School of Chemistry and Biochemistry. "To do that, they need a cost-effective energy source that can perform efficiently for extended periods of time, while also providing high pulses of power when needed." Tsukruk is leading the second interdisciplinary research group, which is focused on designing, fabricating, characterizing and simulating the performance of inorganic/organic nanocomposites for tunable, adaptive materials. "When these adaptive materials are exposed to heat or light or both, they will change their properties in ways that will be useful for sensing or morphing surfaces," said co-director Tsukruk, who also holds a joint appointment in Georgia Tech's School of Polymer, Textile and Fiber Engineering. The third thrust is being led by Michelle LaPlaca, an associate professor in the Wallace H. Coulter Department of Biomedical Engineering at Georgia Tech and Emory University. LaPlaca and her team plan to develop tools and assessment methods to optimize critical cognitive processes of the modern warfighter. "U.S. Air Force analysts must remain attentive to computers and controls for hours at a time, so we aim to find a molecular signature of cognition that is sensitive to changes in stress levels and correlate these molecules with functional brain maps using magnetic resonance imaging techniques," said LaPlaca. "We want to learn about a warfighter's physiological response to different situations and use this information to optimize training and work effectiveness." In addition to its research objectives, another goal for the Center of Excellence is to conduct stimulating collaborative research that will motivate students to consider working at AFRL. "At Georgia Tech, we've had a history of sending outstanding alumni to work at AFRL, including three of our recent Ph.D. graduates. As students, they were able to collaborate with researchers at AFRL and spend extended periods of time at the AFRL facilities, which opened their eyes to AFRL's exciting opportunities and dynamic research atmosphere," said Sandhage. Other core members of the Center include Regents' Professor Mostafa El-Sayed, professor Seth Marder and assistant professor Nils Kroger from the Georgia Tech School of Chemistry and Biochemistry; professor Bernard Kippelen from the Georgia Tech School of Electrical and Computer Engineering; Shella Keilholz, an assistant professor in the Coulter Department of Biomedical Engineering; Eric Schumacher, an assistant professor in the Georgia Tech School of Psychology; and Hamish Fraser, a professor in the Department of Materials Science and Engineering at The Ohio State University. Researchers will be added to this core group as early as next year, when the Center begins awarding seed grants to Georgia Tech faculty members. "The goal of this seed grant program is to establish new connections to talented Georgia Tech faculty members that can result in long-term relationships and fruitful collaborations with the U.S. Air Force," added Sandhage.